MUMBAI: In a show of camaraderie by bickering allies, Maharashtra Chief Minister Devendra Fadnavis and Shiv Sena president Uddhav Thackeray on Wednesday jointly took part in rituals marking the start of construction of a memorial for Shiv Sena founder Bal Thackeray. The move assumes significance as the Shiv Sena, an ally of the BJP at the Centre and in Maharashtra, has been at loggerheads with its senior partner and critical of various policies of the governments. 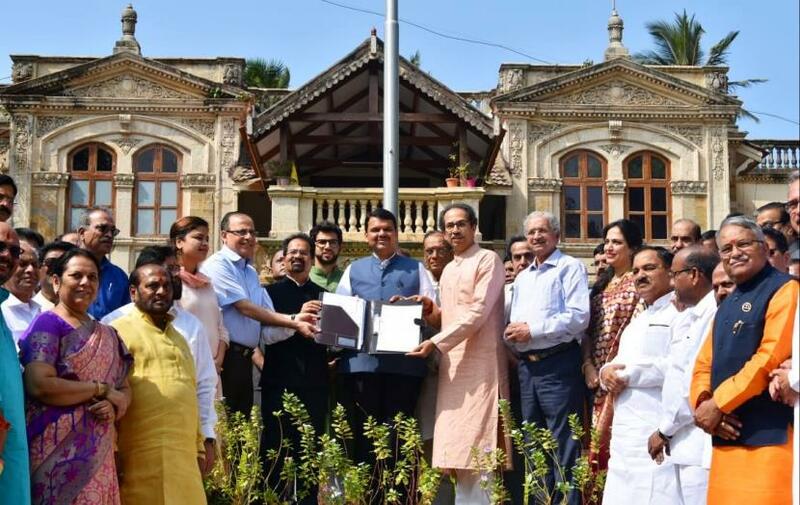 The Maharashtra Cabinet had on Tuesday approved Rs 100 crore for the construction of the Thackeray memorial, a move seen as an attempt to reach out to the ally ahead of the Lok Sabha polls. On Wednesday, on the occasion of the 93rd birth anniversary of Bal Thackeray, Fadnavis and Thackeray jointly conducted the 'Ganesh pujan' (offering prayers to Lord Ganesh) and 'vastu pujan' at the memorial site, located at Shivaji Park at Dadar in central Mumbai. At the event, the land earmarked for the memorial was officially transferred by the city civic body to the trust set up to oversee the structure's construction. The prime sea-facing property built in 1928, measuring around 11,500 sq m, currently houses Mumbai mayor's bungalow. A number of BJP and Shiv Sena leaders, city Mayor Vishwanath Mahadeshwar, Brihanmumbai Municipal Corporation (BMC) chief Ajoy Mehta and members of 'Balasaheb Thackeray Rashtriya Smarak Nyas' (trust), including BJP MP Poonam Mahajan, were present at the event. Both Fadnavis and Thackeray were seen shaking hands and exchanging pleasantries. A Sena leader, who was present at the event, said both the leaders also had a brief meeting over tea. "However, there were no political discussions," he said. "The chief minister and other BJP leaders were very comfortable in the presence of Uddhavji and his family. It did not seem to be an event that had leaders of two parties but (appeared) as if between members of one family," he said. With the modalities for handing over the land earmarked for the project being completed, the construction of the memorial is expected to begin from next month. Prime Minister Narendra Modi is expected to be invited for the formal 'bhoomi pujan' ceremony, a source said. The Sena had last year announced to go solo in future elections and a party leader on Tuesday said the state government's decision to approve funds for the Thackeray memorial would have no bearing on alliance prospects between the two parties for the upcoming polls. Meanwhile, the Sena, in an editorial in party mouthpiece 'Saamana', continued its anti-BJP tirade, saying Bal Thackeray was of the view that only 'Hindutva' can save the country and this thought of his led the BJP to come to power. "The present condition and the path of the country is not right. Today, the nation needs to be ruled by 'men'. Even today, borders are being attacked by Pakistanis, soldiers are dying in Kashmir, however, we are showing our 'josh' by taking credit for surgical strike," it said in sarcastic remarks. The Sena was established for protecting the rights of "sons of the soil". During its conception, political parties like the Congress had said Bal Thackeray wanted to break the nation, that he was creating a division between castes and regions and that there was no place for a regional political party, the publication noted. "The Sena, as a regional political party has been shining on the national front. Today, the country's politics has gone in the hands of regional parties and national parties like the BJP and the Congress are trying to increase their stature in states with the help of regional satraps," it said. Recently, 22 anti-BJP regional parties came together in West Bengal. When attempts to "swallow" these parties failed, bids were being made to woo them, the Marathi daily said.